Registration: 8:30 a.m., Racetime: 9:30 a.m.
Summer may be coming to an end, but don’t fret— it’s time for the annual Boxers’ Trail 5K (Saturday, September 9, 2017). Now, we love this race. 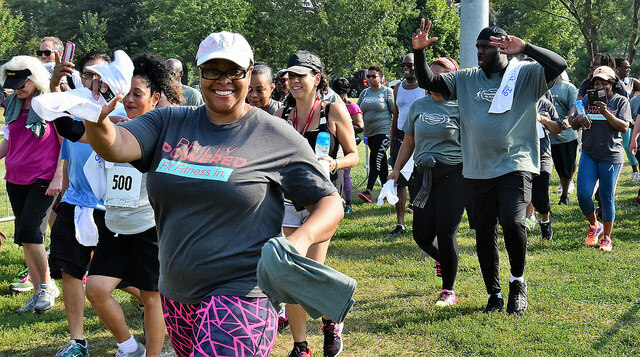 Last year, we took off running with WDAS radio host, Mimi Brown, and several of our Philly Powered Health Ambassadors. The Boxers’ Trail is a great way to get active for any experience level. The course is challenging, but whether you walk, jog or run, it’s a great place for your first 5K. Looking for a few tips to get started as a first-time racer? *Hint, hint* Start here. Ready, set, race like a champ. We all love Rocky, but he’s not the only champ in town. Run on the trail where boxing legend Joe Frazier used to train. Find your stride and a hidden gem. Kelly Drive may have the glory of Boathouse Row, but Fairmount Park is full of hidden (and less crowded) gems. The Boxers’ Trail is 3.8 miles that take you through lush greens, wooded hilltops and past historic landmarks like Mount Pleasant and Strawberry Mansion. Don’t give up, give back. Proceeds from the Boxers’ Trail 5K benefit East Fairmount Park and Mander Playground’s youth programs. BONUS: The end of the race is just the start of the fun. As you cross the finish line be sure to stick around for Strawberry Mansion Day, a community event featuring drummers, dancing and more. And if that didn’t convince you, check out Fairmount Park Conservancy’s blog for even more reasons to head to the Boxers’ Trail. STRAWBERRY MANSION RESIDENTS REGISTER FREE—Just call 215-988-9334 to register over the phone.